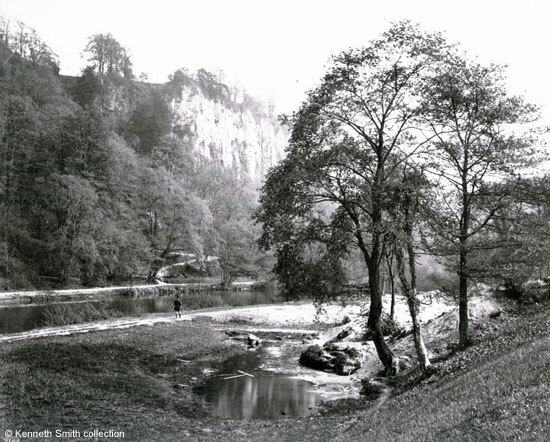 A wonderfully clear photograph of the riverbank at Matlock Bath, which dates from about 1880, shows the land where the Derwent Gardens is today. Beyond the trees was a bank of tufa, approximately at the bottom of Clifton Road. It looks as if they had just begun to quarry this out; the clump of rocks amongst the trees also looks like tufa and there may even be some steps in the rock. On the opposite bank is the Lovers' Walks and the zigzag pathway that climbs up to the top of the hill is clearly visible. Cat Tor is a few yards beyond the path. What the gentleman resplendent in the frock coat, who is wearing a top hat, boots and riding breeches, is doing is unclear. He's not fishing but seems to be studying something. The land seems to have belonged to Major John F. Wieland, who owned the Royal Hotel, as in 1886 the local board discussed acquiring the Orchard Holme Field from him for the purpose of the removal and deposit of ashes. A a meeting seven months later it was said that "the Orchard Holme could be had for very little money". Only two years later the Switchback Railway was built on the land. There is an postcard of the riverbank in 1886, before the Switchback was built, in the "Just" images section. Original photograph, "Derwent Matlock" from Frith's Series 2100 R, in the collection of and provided by and © Ken Smith. Image scanned for this website and information researched and written by and © Ann Andrews. Report of Local Board meeting discussing the forthcoming Jubilee of Queen Victoria, "The Derby Mercury", Wednesday, 9 February, 1887.